Start your spa treatments from scratch by whipping up bespoke beauty products at home. You'd never tell grandma that you don't follow her lasagna recipe to the letter… but the truth is you've never met a recipe you won't tweak. 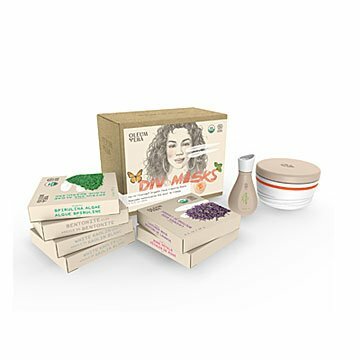 Go ahead and personalize your beauty products, too, with organic DIY kits that make it easy to create custom skin and hair treatments at home. Each kit is built around premium natural ingredients (think plant-based oils, skin-soothing clays, and aromatic dried flowers), which you'll complement with fresh items from your kitchen and mix up in a reusable jar. Whether you're whipping up a scrub, toner, hair treatment, or face mask, the recipes are a breeze to follow and meant to be adapted to meet your skin and mane's specific needs. Made in Canada. 5.8" x 4.3" x 3.2"
I bought this as a gift for a friend. I haven't given it to her yet, but I am a bit disappointed because when I was reading about the product before I bought it, It made it sound like "included in each box is...." So I thought each box contained masks, toners, hair treatments, and scrubs. After receiving the mask box, its JUST the mask. I thought it was a sample of everything. Thats a bummer...hopefully the product is nice! Planning to buy it for my girlfriends...birthdays, fundays..
Just perfect...all around. Smells great, feels great, looks great, makes me feel like I just had the most luxurious spa treatment. Love it... :) Great birthday gift or "just because" gift. Great gift for those who love skin care! The DIY aspect was really unique and thoughtful. Wonderful Birthday Present, Or Treat For Yourself!